His important statement was not mentioned at the Vatican press briefing that day, but it was revealed later in a Twitter message by Father Antonio Spadaro, S.J, a synod father appointed by the pope. It has also been confirmed by several other sources, and at the press briefing, Oct 7. Francis' words take on particular significance in the light of some of the serious challenges that he is facing at this synod, some of which I mentioned in my last report, among them the allegation (expilict or implicit) that the synod under his leadership is somehow putting at risk the church’s traditional teaching on marriage and the family, and the allegation that the synod’s new methodology, which he approved, is more favorable to those who want greater openness in the church’s pastoral approach in this whole area. The pope’s words take on even greater significance in the light of another challenge that has so far gone unreported and was not even mentioned at the October 6 press briefing. It is one that I have since confirmed from several sources (from different parts of the world) who were present when it was made and who specifically described it as "a challenge." It came from the Australian cardinal, George Pell, Prefect of the Secretariat for the Economy and a member of the council of (nine) cardinal advisors to the pope. Speaking near the end of the one-hour “free discussion” session on Monday evening, October 5, Pell suggested that the membership of the special commission of ten persons chosen by Pope Francis to write the synod’s final document should be expanded. 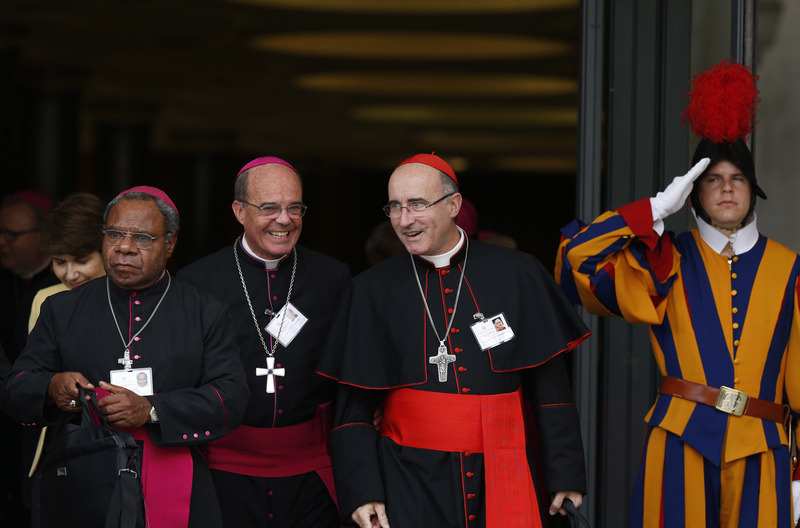 Drawing attention to the crucial role that this commission will have, he argued that it does not have a sufficiently broad spectrum of members, from the different regions, and proposed that its composition be “expanded” with other members elected by the synod assembly. Pope Francis was present when Cardinal Pell spoke, but said nothing. Next morning, however, after Cardinal Lorenzo Baldisseri, the secretary general of the synod, explained the new methodology which Francis had approved on Sept. 7, the pope spoke. He underlined the fact that this synod should be seen as “a continuation” of the 2014 synod, and recalled that in last year’s synod the church’s doctrine on marriage and the family had not been questioned, and remained valid today too. In other words, it is not up for debate. He reminded participants that the question of allowing divorced and remarried Catholics to communion is only one of the many important issues under discussion, and insisted that the synod cannot be reduced to that single issue. He then went onto emphasize the importance of the work in small groups in the reformed synod process, and said the results of these groups will be given to the ten-person special commission that he has established, who will then draft the synod’s final document and present to the fathers for their final approval. In this way, he let it be known that the composition of that commission remains unchanged. Sincerely no offense to the author, but why read the article when the included photo pretty much says it all? Darn, now I won't be able to get a mental image of Jesus in a dashing costume out of my mind. Conspiracies can be good or bad, depending on whether the order of things to be reformed is bad or good. This would be the first meeting of this kind in the history of humanity in which there is no conspiracy. Acts 15 bears witness to a good conspiracy to get rid of a remnant of the Old Law about circumcision. Hope that the Holy Spirit creates another good conspiracy to ordain women to the priesthood, and Pope Francis buys into it. Wonderful article as always. Some "c"atholic websites are propagating the lie of "conspiracy" (e.g EWTN's several affiliates, Joseph Fessio's rag and others). It is curious that those who push their fear mongering fail to live be their hero's creed: "Be not afraid", St John Paul II let the dead bury the dead. Fessio and M. Angelica can grab their rosaries, flog each other in the chapels and pray the gay away all they want. For every person they cause to stumble due to their fears, weak, lack of faith, and powerful media machines, they earn millstones around their necks. Canon Law speaks loud and clear about those ordained and religious individuals who cause the Faithful scandal. Would that they follow Canon Law as promulgated by JPII !